Each of the three products are made with high quality ingredients that are perfect for anyone that has acne prone skin, or very dry or itchy skin. All three are infused with soothing Aloe Vera, and Manuka Honey that is perfect for anti-aging, and moisturizing skin without being too oily. I've been using all three products for about 2 weeks. 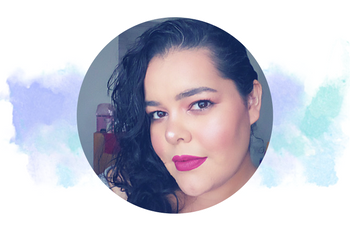 I have acne prone skin, but it has improved since my latest skin care routine. I now experience occasional breakouts. I noticed after my very first use of the Era Organics Cleanse + Restore Face and Body Cleanser, that the small pimple I had on my chin reduced in size the next day. I was happy to see that it worked so quickly, but not surprised since the Era Organics Cleanse + Restore Cleanser is infused with Aloe Vera. Not only does it soothe skin, but it also heals, and reduces inflammation. I love the way my skin feels after each use. My skin is soft and smooth and feels super clean without feeling dry. There's no scent to it so I think that those of you that have a high sensitivity to strong scents would be happy to use it. 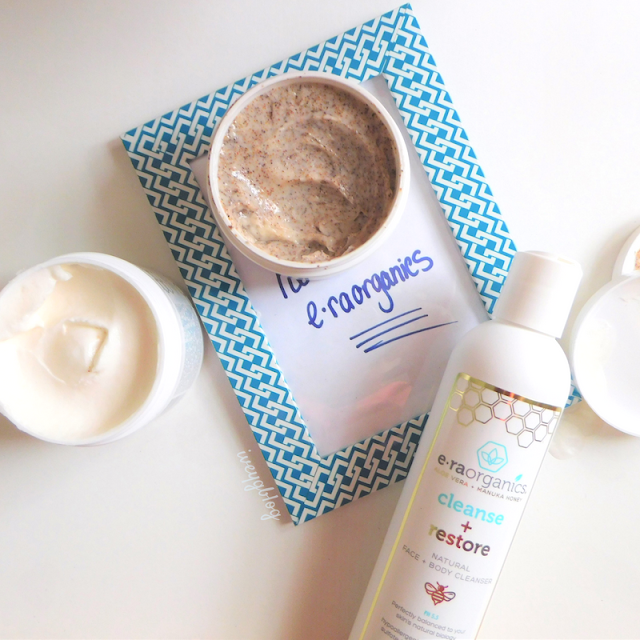 After using the cleanser, I move on to the Era Organics Revive + Microdermabrasion Manuka Honey Scrub and Mask. The Era Organics Manuka Honey, Walnut Scrub and Mask is my favorite skin care product at the moment. It is a 2-in1 product that's infused with walnut shell powder that is gentle on the skin. The walnut shell powder is very light yet effective as a scrub and perfect for removing dead skin cells and making skin feel super soft and smooth. My favorite way to use is as a mask instead. I leave it on for the recommended 5-10 minutes and rinse off with warm water to reveal the smoothest skin ever. Plus it also keeps acne at bay. Lastly, the third step after using the mask is the Era Organics Complete Moisturizer. Along with the two key ingredients Aloe Vera and Manuka Honey, the moisturizer is infused with MSM. MSM helps produce collagen and keratin, and is great for problematic skin. I love the Era Organics Moisturizer because it's so rich and creamy, but once applied to your skin it absorbs quickly. It moisturizes my skin without feeling greasy. My skin looks more plump, and I notice how brighter my skin looks. The melasma above my lips is lighter in color. This is awesome because I struggle with melasma for so long, and I finally found a product that actually works! Beauties, this moisturizer smells good too. It reminds me of the oatmeal I make my children for breakfast because of the light scent of honey. It's not overpowering, and once absorbed you don't smell it. I also use the Era Organics on my head, if you don't know I'm bald right now. Cute short story if you like, check out the details here. So, I love applying it on my scalp because it soothes my scalp and moisturizes perfectly. 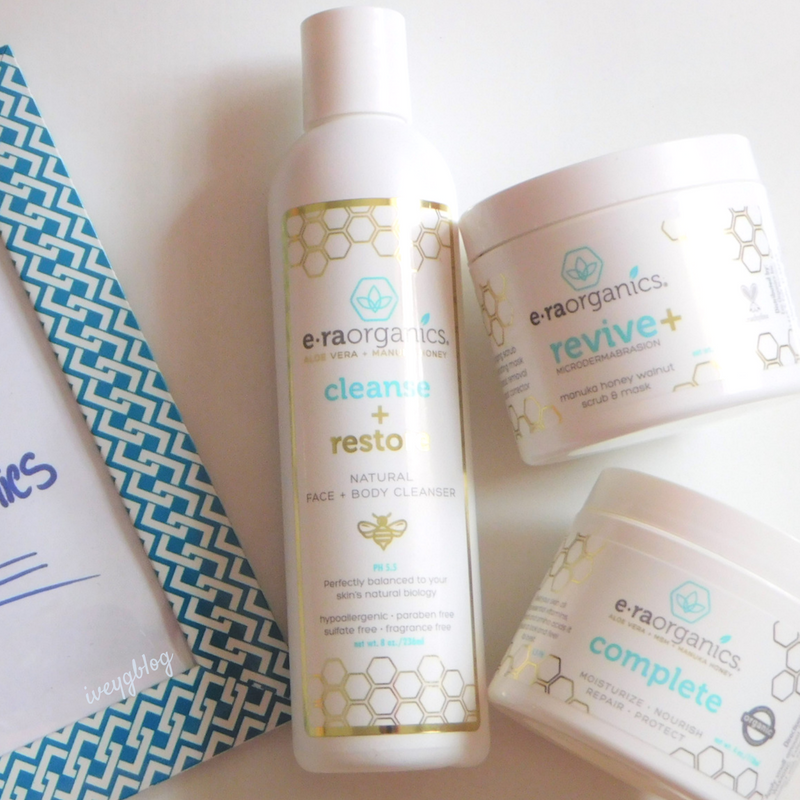 I don't have to worry about parabens or chemicals going through my skin. I highly recommend Era Organics! These products are so amazing at moisturizing, soothing, and healing your skin. If you have problematic skin like acne, melasma, or any other skin care concern these products work! I'm so impressed and continue to use each product to keep my acne at bay. 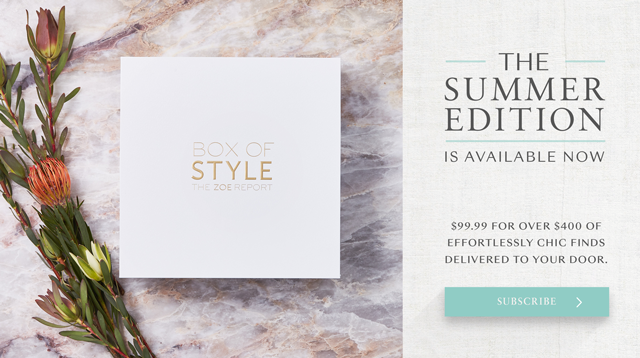 The Era Organics Cleanse + Restore, Revive + Microdermabrasion Scrub and Mask, and Complete Moisturizer retails on sale $13.87, $17.07, $15.07 and is available for purchase on the Era Organics online store. 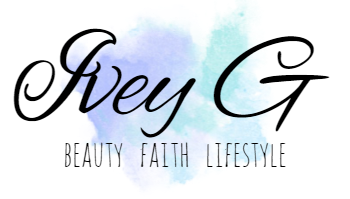 If you are interested in purchasing any of the products mentioned you can use the code BLOGYMOM to save 20% off your purchase. 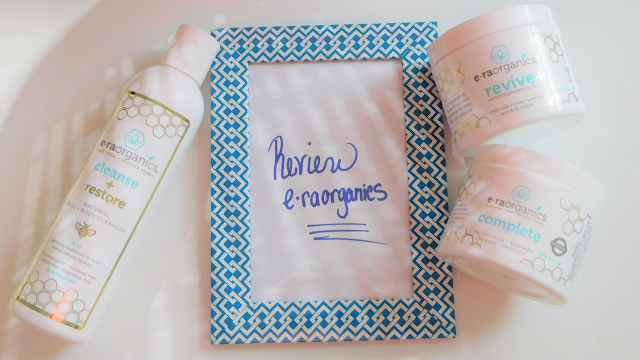 If you tried Era Organics, what's your favorite product?